Throughout my journey I have come across some pretty inspirational people, quotes, articles and videos on Twitter. I thought it would be a good idea to share these things, in the hope that they will inspire you as much as they did me! I’ll start with the most inspirational parable I have ever come across. If you have never heard this before then consider it my gift to you for visiting my site. I have learnt that Nike make the most amazing running vidoes! But, at the end of the day, Isn’t this what it’s really all about? Chris was very seriously injured but went on to do some unbelievable things! This guy runs a marathon UPHILL in African heat before immediately doing another..
And This Guy is just ACE! The worlds greatest run streaker ends his streak. Due to ill health Ron has decided to take a day off. Jonathan beat cancer 4 times and still managed to complete an Ironman, his blog Is the most inspirational I have ever seen.. I got a ‘Go on Iron!’ from an Ironman king…. And a ‘Whoop!’ from an Ironman Queen…. @ironrookie_com @UkTriChat Whoop! See you there! 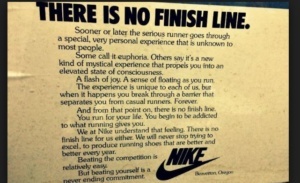 I thought my marathon was hard, and then I saw this…. @CunliffeJo @UKRunChat @jonomurphy7 You know what……… I just put me trainers on……AND GO FOR A RUN!!!! ? @ironrookie_com just keeping going. Trainingwise time on feet. I walked for 4 hours at a time in training. And eating often and little. And I have learnt that if you have kids, these must be treasured forever…. I discovered that when you do this – the energy rush is immensel! I learnt to Count my blessings, everyday! And before you think it’s all too late because you are now too Old,….. I learnt to Think Again……. I hope some of the things on this page Inspired you like they did me! If so drop me a line on twitter and let me know – It would be great to hear from you! You can contact me by clicking on the blue button below!